Innovation – Digital innovation and transformation. Dan brings more than 25 years of technology sales, CRM domain expertise, business consulting and management experience to his role at salesforce. He is a recognised thought leader and is routinely sought after by the media and industry analysts. Previously he led the Financial Services Industry Business Unit at Oracle across Asia Pacific and Japan for four years. Prior to that, Dan spent six years at Siebel Systems leading their Public Sector and Financial Services solution consulting across Asia Pacific. He also worked for ten years at PwC as a technology consultant, leading technology engagements in Australia, New Zealand, Singapore and Malaysia. 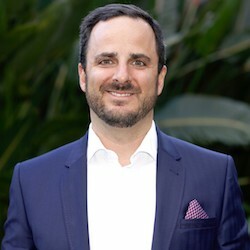 Dan holds a Masters of Business Administration (MBA) from the Australian Graduate School of Management, and a Bachelor of Commerce from University of New South Wales. He is also a member of the Australian Institute of Company Directors. Dan currently sits on the Advisory Board for the Olga Tennison Autism Research Centre (OTARC), within La Trobe University in Melbourne, Australia.